NLM Director Patti Brennan (left) listens to Debra Chew, Director of the NIH Office of Equity, Diversity, and Inclusion, talk about the MLK exhibition on display outside the Lister Hill Center auditorium. 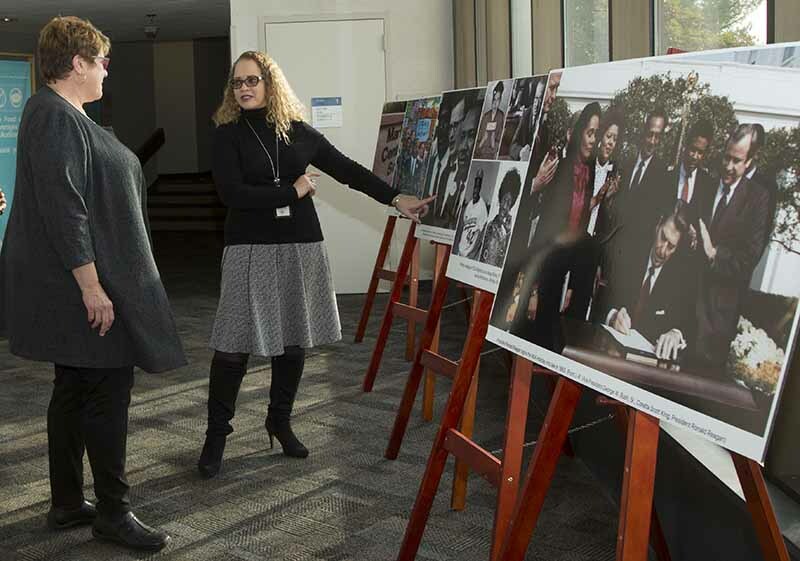 NIH’s Office of Equity, Diversity and Inclusion partnered with NLM to share photos of Martin Luther King, Jr., and the civil rights movement. Nine poster-size photographs will be on display outside of the auditorium in the Library’s Lister Hill Center until the end of Black History Month, February 28. As part of the exhibition called “A Day On, Not a Day Off,” visitors are invited to write their reflections. The exhibition is open from 8:30 am to 4:00 pm weekdays, except federal holidays. January 19, 2017 in Exhibitions.